Above: Letter to the Flowers. Good morning, good morning! I was just catching up with a few messages and whatnot around Etsy when I stumbled upon these gorgeous artworks and had to drop everything to hop over here and share them with you... ! 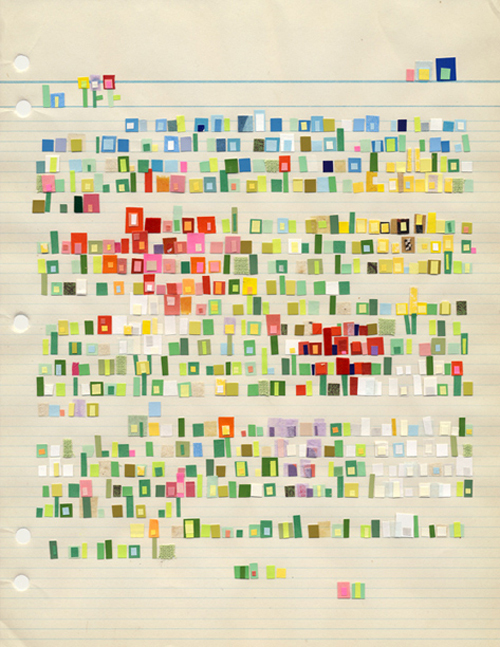 These inspirational 'Letter Collages' are by Boston based, Spanish artist Catalina Viejo Lopez de Roda. Each one is a letter that conveys the artist's emotions to a particular person or subject, but instead of using the written word she has hand cut and collaged tiny snippets of paper to illustrate her thoughts. "Each letter is aimed at a very specific being. I think about someone or something that I want to write a letter to and I then translate my feelings about the person, being or thing and the emotions that they express into a combination of shape and color. I feel that words are not necessary in order to convey a feeling or idea. The "letters" vary from specific people to more abstract entities like nature or emotions. Literal words are turned into shapes of color, and specific palettes and structures arrive in each letter. Most of the collage elements are recycled adding a sense of history to the letter." Top left: Letter to Summer, top right: Letter to Barack Obama. Middle left: Letter to Those Who Think Outside the Box, middle right: Letter to a Poet. 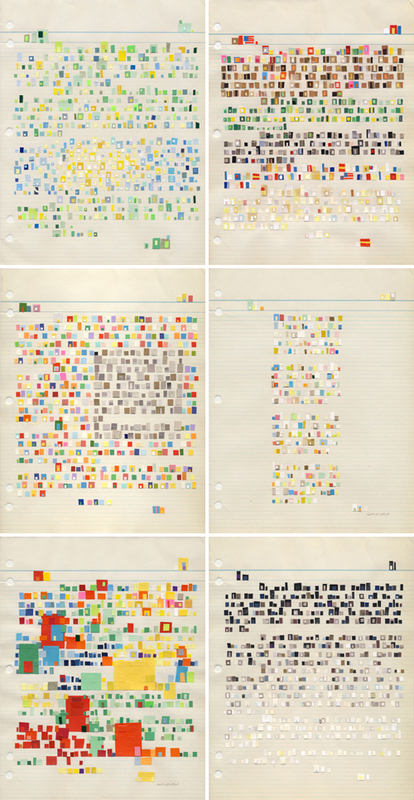 Bottom left: Letter to Hans Hoffman, bottom right: Letter to the ones we've Lost. Aren't they beautiful and inspiring? Can you sense the emotions in these letters? Joy and pleasure, sadness and loss, hope and optimism... Wouldn't you just love to have something like this drop through your wee letterbox? Beautiful work, I love these! Wow, what amazing work. I am simply awed by the way that her brain works. Thank you so much for sharing this. fantastic. thanks for sharing this. Ooh, Emma, great find! These are absolutely gorgeous! And so unique!